As Christmas nears, we are all looking for fun ways to go through the birth of Jesus. 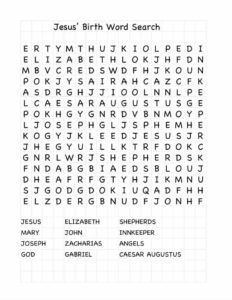 Here is a word search that helps the children in your class, or home, to recognize the names of people involved in the birth of Jesus. You can use it as a review after you have gone over all of the stories in your class, or use it as a teaching tool to tell each person’s part in the birth.